S7 Engineering, a subsidiary of Russian MRO provider Engineering Holding, has landed a major six-year order to repaint airliners for Kazakhstan’s national carrier Air Astana at its Mineralnye Vody facility. Engineering is also hoping to win a long-term contract to provide maintenance on the operator’s fleet. The first Air Astana airliner has already been served under the agreement: an Airbus A321 (P4-KDA) was repainted in mid-November. Delivered factory-new five years ago, the aircraft is currently undergoing scheduled maintenance at S7’s Mineralnye Vody operation. 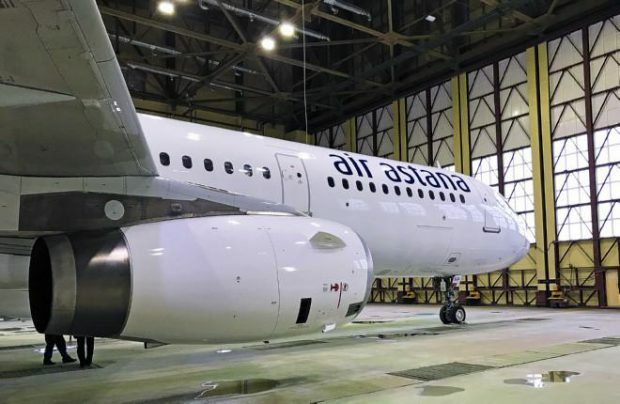 The Engineering paint team has worked with Air Astana on a one-off basis in the past; the current deal might involve nearly 30 airframes if it proves to cover the carrier’s entire narrowbody fleet. Engineering Holding notes that the exact number of aircraft to be painted at Mineralnye Vody will depend on Air Astana maintenance program. Notably, S7 Engineering has won the contract to paint Air Astana aircraft as a result of an open tender procedure. According to Russian Aviation Insider data, the largest international paint shops took part including European MAAS Aviation, Air Livery, Airborne Colours; Chinese Taikoo, Xiamen Aircraft Engineering) and Russian Spektr-Avia. Stanislav Mitin, Engineering Holding leading sales manager told Russian Aviation Insider, that the contract to paint Air Astana aircraft might transform into a deeper cooperation between the Russian service provider and Kazakh airline. “We hope that this project will allow Air Astana to fully estimate the highest quality standard of S7 Engineering services and will become an important step towards the cooperation in aircraft maintenance,” he said. According to Mitin, Engineering Holding will take part in the tender procedure to provide long-term maintenance for the whole Air Astana fleet. Notably, the tender procedure won by Engineering Holding to paint Air Astana aircraft might serve as an additional reason to expand its paint shop facility. S7 Engineering won the contract to paint Air Astana aircraft as a result of an open tender procedure. It was bidding against a number of international paint shops, including MAAS Aviation, Air Livery, Airborne Colours, Taikoo, Xiamen Aircraft Engineering, and Spektr-Avia. Stanislav Mitin, a leadsales manager at Engineering, told Russian Aviation Insider that the paint contract with Air Astana aircraft might transform into further cooperation: “We hope that this project will give Air Astana a chance to fully appreciate the highest quality standard offered by S7 Engineering, becoming an important stepping stone towards a broader partnership.” Mitin added that Engineering will continue to bid as a potential full-scale MRO provider on all of Air Astana’s fleet.